READING the text of Craig Claiborne's original 1966 article in the New York Times about David Eyre's pancake, it's difficult to know if the lure was in the actual food, or the setting where Claiborne consumed it. "With Diamond Head in the distance, a brilliant palm-ringed sea below and this deliciously flavored pancake before us, we seemed to have achieved paradise," Claiborne wrote. Eyre, editor of Honolulu Magazine from 1966 to 1976, was vice president in charge of public relations for Castle and Cooke -- the parent company of Dole Food Co. -- at the time of the brunch in late 1965. In a story he wrote for the Honolulu Star-Bulletin in 1981, Eyre noted that he'd failed to mention to Claiborne that macadamia nuts and pineapple chunks made fabulous pancake toppings, and chided himself for the missed opportunity. He also disagreed with Claiborne about "defiling the virginal vittle" with jellies, jams or syrups. "It makes its own syrup with sugar and lemon juice," Eyre, 95, said from his apartment at One Kalakaua. A little fresh mango might complement it beautifully, but otherwise Eyre firmly believes the pancake doesn't need help. As Claiborne wrote, it's "elegant, delicate and as spectacularly rich as it is easy to prepare." Serving it immediately is also an essential part of the presentation, said Eyre. "You make an entrance with it: Ta da! But you have to make a quick entrance." 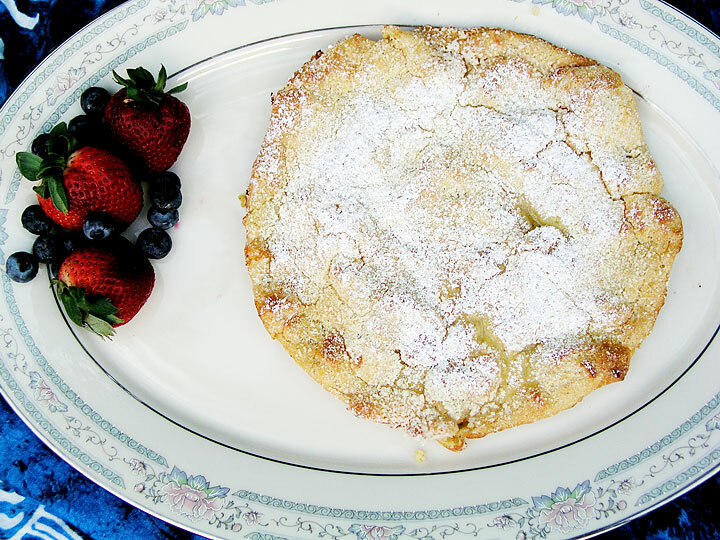 In the March 25 New York Times Magazine, writer Amanda Hesser almost mocked the simplicity of the recipe, but praised the reward: "The surprise comes, appropriately, at the end, when you open the oven door to find a poofy, toasted, utterly delectable-looking pancake. This soon collapses as you shower it with confectioners' sugar and lemon juice, slice it up and devour it. It's sweet and tart, not quite a pancake and not quite a crepe. But lovable all the same. Melt butter in a 12-inch skillet with a heatproof handle over medium-high heat. (An 11-by-7-inch Pyrex dish will work equally well, according to Eyre.) When butter is very hot but not brown, pour in batter. Bake until pancake is billowing on the edges and golden brown, about 15 minutes.